Writing can be a lonely job, sitting in front of that high resolution screen, trying to squeeze elegant sentences out of an unwilling cortex. The apps we use are our toys, imaginary friends who help us get the job done. A bit like the Tooth Fairy, really, but with binary code and passwords. Scapple comes from good stock: it is produced by the folk at Literature and Latte, who brought us Scrivener, a writer’s best friend (after inspiration and momentum). Scapple is a free–form note–taking app. It allows you to type anywhere on the page, and notes can be connected by arrows. 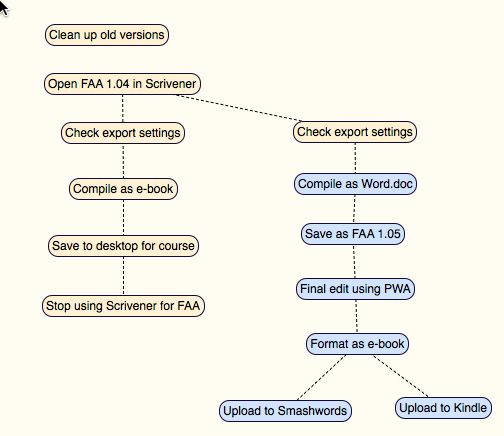 Hm, a mind–mapping app, you say. Not quite, since you can use Scapple without relying on any central idea, linkages or hierarchies. It is more of a brainstorming, content development app. I use Scapple to develop scenes for my novel. Let me show you what I mean.